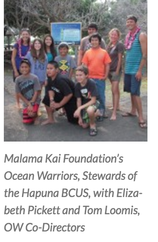 Thank you for your interest in setting up a Beach Clean Up Station (BCUS)! 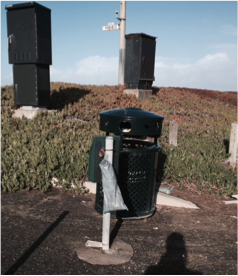 Our Stations provide beachgoers with an easy, enjoyable way to clean up beach trash. Our Stations also strengthen community bonds through their installation, maintenance and use. Despite their name, our Stations can be set up virtually anywhere. There are different types of Stations, not only on beaches but also in watersheds, on lakeshores, in schoolyards and on trails. Because every site, land agency and community is different, you will need to determine what works best for your area. 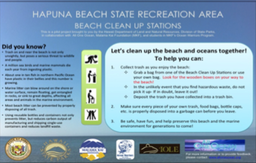 BEACH CLEAN UP STATIONS (BCUS) These are the Beach Clean Up Stations at most of our sites. Mounted at the entrances to beaches and watersheds, these Stations are stocked with repurposed, reusable bags beachgoers use to collect trash. BCUS, Information and Service Stations are all adorned with children’s Ocean-themed art and educational signage instructing beachgoers how to use the Stations. 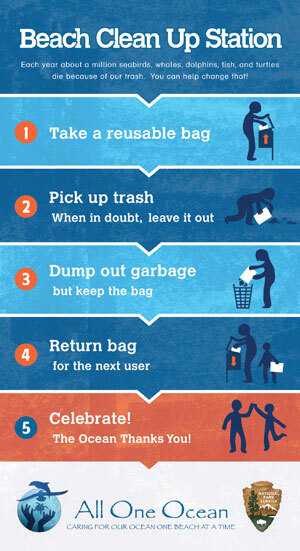 The signage also educates beachgoers about the dangers of marine litter and provides simple ways to reduce waste. INFORMATION–ONLY STATIONS These are signs with information about the destructive impact of human trash on marine and human life and what we can do to reduce our waste. We installed an Information-only Station at Hawaii’s Hapuna State Park on the way to Hapuna’s two Beach Clean Up Stations. SERVICE–ONLY STATIONS You can install Service-only Stations. These are community-supplied canisters with repurposed Beach Clean Up bags.